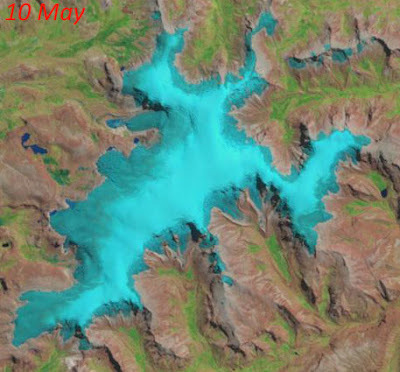 Through calendar year 1998, Quelccaya was exceptionally well documented by Landsat imagery. From January into early November the ice cap is visible in almost every scene, as the satellite passed overhead every 16 days; 4 are entirely cloudless. Inspired by the Earth Observatory images of Quelccaya posted recently, collaborator Carsten Braun compiled and registered 16 scenes to demonstrate the annual cycle of accumulation and ablation at Quelccaya. These are shown below as an animated GIF cycling continuously through the 16 images, with the 1998 date shown in the upper-left hand corner. In mid-January, when the wet season was well underway, the 1998 transient snowline is generally only 100-200 m higher than the ice cap margin. Two months later when the wet season is typically concluding, most of the glacier appears covered by snow - yet not quite to the margin and not on terrain adjacent to the ice. Two April images depict the greatest spatial extent of wet-season snowcover on the glacier, with thin cover on other high-elevation areas. By mid-May snowcover had decreased considerably, with snow present only on the glacier - and a transient snowline higher than in the mid-January image. (The 10 May image is shown above; registration issues precluded including it in the sequence below.) Snowline moves slightly higher by mid-June. Surprise! 27 June is well into the dry season, yet snowline reaches the lowest elevation for the year (at least to early November 1998). This scene also has the greatest spatial extent of regional snowcover for all of 1998. By the end of July almost all snow was gone from the landscape again. The transient snowline on the glacier rose continuously through July, August, and September. Very little accumulation for 1997-98 remained by the 15 September image. The image of 1 October shows what appears to be thin snowcover entirely blanketing the glacier. Little snow is visible elsewhere, except to the north in this image; the larger, un-cropped scene on this date shows a very different pattern of snow distribution on the landscape than after the winter (dry season) event of 27 June. By early November the next accumulation season appears to have begun, with deeper snow covering the ice cap and extended slightly beyond the margins. The previous post compared two Quelccaya satellite images discussed on NASA's Earth Observatory website. Among the many interesting features these show is the transient snowline at the time each image was acquired. Landsat images for any particular location (e.g., Quelccaya) can only be acquired when the operative satellite passes overhead, which has typically been limited to an interval of ~16 days. Useful image frequency is further limited by clouds obscuring the scene. In a recent manuscript submitted to The Cryosphere Discussions, authors Maiana Hanshaw and Bodo Bookhagen tabulate many of the best images that include Quelccaya and the Cordillera Vilcanota, beginning with those from Landsat 2 in 1975. Our measurements on the ice cap provide a context for the 2010 EO image. The graph below shows how surface height at the summit generally decreases through the dry season. Each year of our measurements is shown in black, and for dry season dates common to all years the mean daily height is blue. Note that height decrease is not linear, which reveals important information about the processes involved! Also shown (in red) is height through the 2010 dry season, with a pink circle indicating the EO image date. Most of the surface lowering (e.g., ablation) took place after the latest available image that year - and the 2010 dry season was the longest of our 8-year record. Before the dry season began, accumulation for the El Niño wet season 2009-10 was the lowest of our record (until this year), with maximum snowdepth reaching 1.79 m on 12 April. So, with lower than normal snowfall and a prolonged dry season - in which albedo steadily decreases - the snowline likely reached a considerably higher elevation than shown in the 2010 image, acquired two months before the dry season ended. This year, maximum snowdepth was comparable to 2010 (1.78 m), yet reached a month earlier (18 March). A few snowfall events during April and early May have added mass, yet as of 15 May the surface is dropping below the mid-March height. This year and 2010 are the 2 lowest years of accumulation since our measurements began in 2004 (measured as snow depth, without consideration for density). For the first day of May both years, accumulation was >25 cm below the median depth (not shown in figure). On Quelccaya this July we will measure density profiles and determine the more important measure of accumulation, which is water equivalent. If our team stays strong and our shovels don't all break, we will attempt to reach what remains of 2009-10 accumulation - assuming the 2010 snowline didn't rise above the summit! NASA's Earth Observatory "Image of the Day" (IOTD) has just published a pair of Quelccaya images from Landsat 5's Thematic Mapper, taken 12 years apart. Perfect registration and color correction provide a fantastic opportunity to view and explore environmental change: click here, and then below the images click the shaded button labeled "VIEW IMAGE COMPARISON". Now note the vertical slider bar in the image center which can be moved from side to side with the mouse to compare the scenes in 1988 and 2010. A To the east of the label, a marginal lake had just begun forming here in 1988, which gradually enlarged with ice recession. Note the thin ribbon of green extending north to the bofedal on the 1988 image; this meltwater runoff also provided water to the research camp for many years. Sometime between the 2006 and 2007 dry seasons, the lake abruptly drained subglacially into the lake below the "A" on the image, and then flooded down into the next valley to the south. Water from the glacier no longer flows past the camp, and neither a section of bofedal above the "A" nor the green ribbon are visible on the 2010 image. 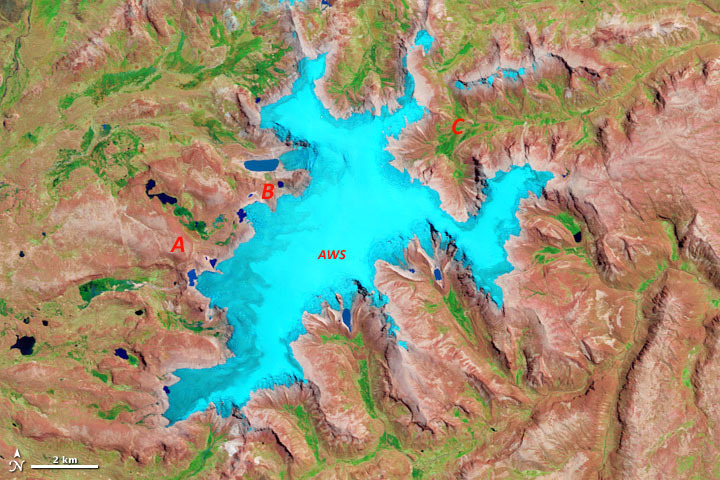 The bright tan-colored ribbon visible on the 2010 image below the "A" resulted from sudden drainage of the marginal lake discussed above. Water flowed under and beside the glacier into the lake (not even present in 1988) and then sloshed over a bedrock sill and cascaded as a flood to the valley below. Sediments displaced into the bofedal are visible in the image; note also that the dark-blue lake just above the North arrow has increased in size. Several lakes in this valley were cored by Meredith Kelly, Tom Lowell et al. in 2011, and the record they produce will put this event into a Holocene perspective. B Just north of the "B" label is Qori Kalis outlet glacier, regularly monitored by the Ohio State group (Henry Brecher & Lonnie Thompson; also see here for an dual-image comparison). With the terminus no longer in contact with the lake, the rate of ice loss due to recession has slowed - yet the glacier is rapidly thinning. On-the-ground panoramic views of the area from 2012 include Qori Kalis (here and in greater detail here) and the margin to the south (here) where on the 2010 image - just 2 years prior - this lake was barely visible. C This valley to the northeast of Quelccaya appears to have received increased meltwater runoff since 1988, as evidenced by the extent and saturation of green in the 2010 image (i.e., move slider back and forth to see changes). This illustrates the paradoxical impact of glacier recession on water resources: in areas of increasing melt, more meltwater reaches bofedals in the valleys below, promoting plant growth (typically water-limited here, at ~5,000 m elevation). There are a multitude of other downstream effects as well, on both natural and human systems. At some point as the glaciers continue shrinking, the enhanced runoff will begin to diminish. Note the tremendous ice loss on the ridge north of this valley! Finally, the timeframe for this comparison must be put into context, as the dramatic changes shown by these two images span only a brief moment in the context of Earth history. Ice extent at Quelccaya has fluctuated in the past, of course, but likely never at the modern rate. For example, radiocarbon dating of plants emerging from beneath the ice near label "B" reveals a retreat rate that is nearly 2 orders of magnitude higher than the rate of advance (Thompson et al., 2013). Adapting to this rapid recession - at Quelccaya, elsewhere in the Andes, and globally - will be a major challenge for humans and all organisms dependent upon glacier meltwater runoff.